SINN Fein President Gerry Adams has tonight denied there has been any cover up of sexual abuse by the party – but admitted there are issues surrounding how allegations were handled in the past, and that the IRA was 'singularly ill-equipped' to deal with the matter. In a blog post, he also clarified the role played by the IRA in policing nationalist communities in the north during the troubles. 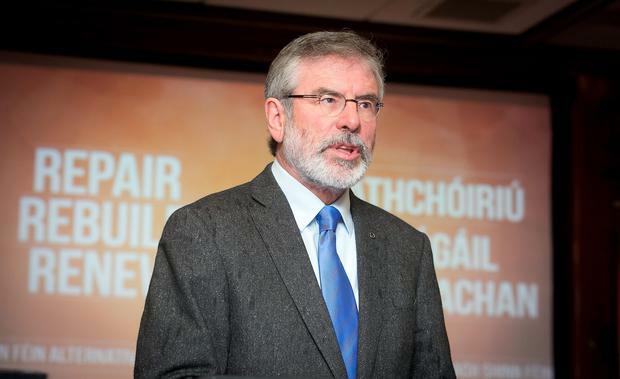 “The recent allegations made by Maíria Cahill are of serious concern to myself and Sinn Féin. “While I refute completely Maíria’s allegations against myself and Sinn Féin it does raise the significant issue of how allegations of abuse had been handled in the past by republicans.” He said. He explained that the IRA came to become involved in policing in the north after nationalist communities turned away from the RUC. “After the pogroms of 1969, Internment in 1971 and Bloody Sunday in 1972 the vast majority of nationalists withdrew any consent to be governed from the Northern state, it's institutions and agencies. The Louth TD admitted that IRA members were ‘ill-equipped’ to deal with such matters - and that offenders were often shot. “IRA personnel were singularly ill-equipped to deal with these matters. He also admitted that victims were failed by this system – as it left them without necessary supports. He called on anyone with information on abuse to either approach the Gardai or PSNI.